Lines at asphalt plants can be extremely long, especially during the peak of paving season. driver to return to the jobsite, where the crew is waiting. But, does that time lost cost you enough to justify purchasing your own asphalt plant? There are numerous factors to consider before you take that step. We’ll walk through each with you in this new blog series, starting with exploring your market. ed supplies through peak paving months. 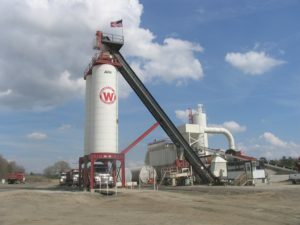 Because large asphalt producers often consume the bulk of aggregates supplies, a new asphalt producer may need to look for a nearby aggregates source. Also, take the time to look at contracts awarded in the area. Investigate the number and sizes of paving companies that work in the area. Analyze what percentage of bids a new asphalt plant would be able to supply in the years to come.